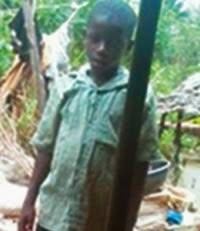 This 10-year-old boy, Usen Okon, was thrown into the Imo River in the Ikot Abasi area of Akwa Ibom State, over witchcraft accusation but he survived the ordeal. Government Area of the state as his parents had died. He said , Okon was aroused from sleep a few days ago by Ekaeyen who took him to her husband and asked him to confess to being a wizard. He added that when Okon denied the witchcraft accusation, his aunt threatened to throw him into a river. Ojedokun said Ekaeyen, true to her words, on November 16, took Okon to the Imo River and threw him into the water with the hope that he would drown. “She actually threw Okon into Imo River thinking that the boy would drown. The boy came out of the water alive and went to their home, only to be told that her auntie had relocated,” Ojedokun said. The acting Police Public Relations Officer, Akwa Ibom State Police Command, Mr. Iboro Victor, said he was not aware of the incident.